About 20 miles east of Kampala, in the district of Mukono rests an isolated plunge of river’s water referred to by central Uganda’s Buganda Kingdom as The Sezibwa Falls, one of the most fascinatingly ideal Uganda Safari and Tour destination nearest to Kampala the capital city. Appealing to very many dissimilar niches, the falls are a central pulling factor for sightseers with divergent intentions labeled in its beauty, biodiversity, never-boring surrounding topography and its cultural attachments. Buganda Kingdom, the most dominant of all existing ethnic groups in Uganda, protects the Water Falls as their own cultural heritage. Very many attention-grabbing tales are told by the “Baganda” (the name used to mean a person from Buganda Kingdom) site guides in relation to the falls, making this site always encountered on Uganda Safaris and tours a sensitively personal experience. 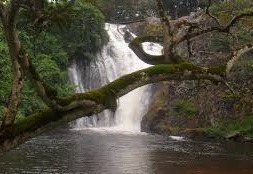 The Baganda believe that the waters of the Sezibwa River which plummet to form the falls, and their younger twin brother Bwanda were divinely born by a spiritual being called Nakkungu Tebatuusa and the Baganda who live around the falls are known for praying to Sezibwa, a god. From “Sizibwa Kibuubo”, a local catchphrase meaning “nothing can block my way”, forms the name for the River considering its power to steadfastly drive through obstacles like the nearby solid swampy vegetation to victoriously plunge into the iconic Sezibwa falls. While touring Sezibwa on safaris in Uganda, visitors are also served to beautiful views of the surrounding hills carpeted by beautiful planted and naturally existing vegetation species with very many shades of green. Lucky visitors may also see a couple of freely traversing reptiles and amphibians including snake species of unlike sizes and lengths like the black mamba and frogs. A scan through the forested entrance to the site is a delight to bird-lovers, because the area attracts up to 150 resident and migrant bird species making it one of the epitomes for Uganda Birding Safaris closest to the capital city. The Safari can also be extended to include rock climbing, cultural encounters, nature walks; and for those who would like to spend a night or two to experience the blessings of the ancestral spirits that roam the area, there are secure camping sites just adjacent to the Sezibwa Water Falls.